We are a study and action group exploring democratic alternatives to capitalism. We believe that the present market system, in which one per cent of the world’s population owns 40 per cent of the world’s wealth, is not only spiralling towards ecological catastrophe, but also systematically undermining all forms of human solidarity, spreading an ethos of survivalism and antagonism. This requires an increasingly authoritarian state to control a society in meltdown. We want to build an libertarian socialist alternative. We want to move beyond single issue protest to patiently building new kinds of democratically-controlled institutions. We believe that Social Ecology is an appropriate framework for those aspirations. Opposed to all forms of hierarchy not just class oppression, Social Ecology is committed to the construction of a ecological society based on face to face local assemblies, in which power is held by citizens, not elites. We are also exploring the economic foundations of a post-capitalist society through visions such as Parecon. Study groups have been formed for more than 200 years to build alternatives to seemingly impregnable political systems. At a time when traditional left-wing ideologies have completely capitulated, we believe it is vital to establish to theoretical foundations of a new opposition. Before we can act, we must know what we think and the kind of society we wish to create. We believe that study groups can become the nuclei of a new political movement. We are currently building a network of study groups which we hope will evolve active political organisations in their localities. “What do you want?” is a constant query put to economic and globalization activists. 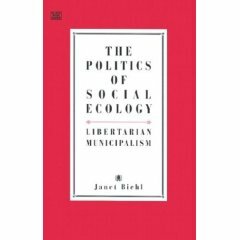 In yet another volume, Albert expounds on his answer—participatory economics, “parecon” for short—a new economy, an alternative to capitalism, built on familiar values including solidarity, equity, diversity, and people democratically controlling their own lives, but utilizing original institutions fully described and defended in this book. A short introduction to the ideas in the book can be found here, at the Parecon website. This expansive collection ranges over, amongst others, Bookchin’s account of his teenage years as a young Communist during the Great Depression, his experiences of the 1960s and reflections on that decade’s lessons, his vision of a libertarian communist society, libertarian politics, the future of anarchism, and the unity of theory and practice. He goes on to assess the crisis of radicalism today and defends the need for a revolutionary Left. Finally, he states what is to be valued in both anarchism and Marxism in building such a Left and offers guidelines for forming a new revolutionary social movement. This was the first book we read as a group and it took around 2 months to finish.